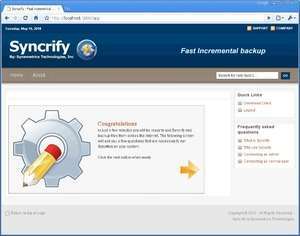 Syncrify uses smart-compression, which compresses data before sending them over the network. In cases where compression has no or very little affect on the file size, Syncrify saves CPU cycles by transferring the files as-is. For example, a 10MB MP3 file won't benefit from compression whereas a 10MB Text file can be easily reduced to less than 1 MB with compression. Version 3.9.884 is a freeware program which does not have restrictions and it's free so it doesn't cost anything. For security reasons, you should also check out the Syncrify download at LO4D.com which includes virus and malware tests. Additional screenshots of this application download may be available, too.